This item is expected to ship 4-6 weeks after the event on April 11, 2019. There’s no better feeling than providing relief from suffering. From the chronically stressed, to those grappling with trauma, dysfunctional relationships with food, substance use issues or anger -- you love the fulfillment of making a difference. But shame, guilt, and self-criticism play a critical role in these problems and can dramatically disrupt therapy. You worry that you’ll fail to convince clients who feel unworthy that they deserve a better life. 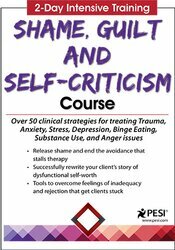 And you’re left frustrated, drained and unsure what will move therapy forward when fears about failure and inadequacy create a state of paralysis in shame-driven and self-critical clients. This recording will give you the skills and tools you need to end the tyrannical hold of shame, guilt and self-criticism and empower your clients to develop the acceptance of themselves, others and reality necessary for the effective treatment of trauma, stress, anxiety, depression, binge eating, substance use, and anger issues. Experience the satisfaction of greater therapeutic success when you can help clients release unhealthy shame and cultivate the self-acceptance they need to move toward a brighter future! Characterize how shame, guilt, and apathy can function as impediments to clinical progress. Establish how clinicians can teach clients techniques to negate the sweeping generalizations that can lie behind shame. Discriminate guilt from regret and communicate how this informs therapeutic approach. Communicate how normalizing strategies can be used with clients to dissipate self-doubt. Articulate how Choice Awareness Training can be used in therapy to combat motivational apathy. Specify how techniques that reframe symptoms as strengths can be used to increase therapeutic effectiveness with self-critical clients. Assess the impact of exposure and mindfulness interventions on affect avoidance. Establish how exercises that help clients rediscover their self-worth can be used in trauma treatment. Communicate how shame pushes clients into binge eating and clarify how self-acceptance interventions can be used to reduce emotional eating. Determine how shame acts as a cover for anger and explain how compassion exercises can be employed to help clients let go of anger. Analyze research that establishes shame as a risk factor for suicide in depressed individuals. Address the importance of managing shame in clients with substance use issues in efforts to prevent relapse. Shame, Guilt and Motivational Apathy as Impediments to Clinical Progress? This self-study program is designed to qualify for 12.5 continuing education hours. This self-study activity consists of 12.5 clock hours of continuing education instruction. The following state psychologist boards recognize activities sponsored by PESI, Inc. as an approved ACCME provider: Alaska, Arkansas, California, Colorado, Georgia, Illinois, Indiana, Kentucky, Maine, Maryland, Missouri, Nebraska, Nevada, New Hampshire, New Jersey, New Mexico, Oklahoma, Pennsylvania, South Carolina and Wisconsin. Certificates of attendance will be issued for you to submit to your state licensing board to recognize for continuing education credit. Full attendance is required; no partial credits will be offered for partial attendance. You are required to successfully complete and submit a post-test prior to receiving a certificate of completion. PESI, Inc. designates this self-study activity for a maximum of 12.5 AMA PRA Category 1 Credit(s)™. This activity was originally recorded on 04/11/2019. It was last reviewed on 12/31/2018 and is valid until 12/31/2021. California Psychologists: PESI, Inc. is approved by the CPA OPD to sponsor continuing education for psychologists. Provider #PES010. PESI maintains responsibility for this program and its contents. PESI is offering this self-study activity for 12.5 hours of continuing education credit. Full attendance is required; no partial credits will be offered for partial attendance. Ohio Psychologist: PESI, Inc. is approved by the Ohio Psychological Association, Provider #263896894, to sponsor continuing education for psychologists. PESI, Inc. maintains responsibility for this program and its content. PESI is offering this self-study activity for 12.5 hours of continuing education credit. ILLINOIS PSYCHOLOGISTS: PESI, Inc is an approved provider with the State of Illinois, Department of Professional Regulation. License #: 268.000102. Full attendance at this course qualifies for 12.5 self-study contact hours.